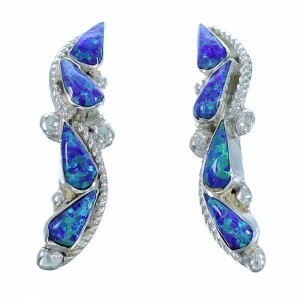 Sterling silver and man made Purple Opal. 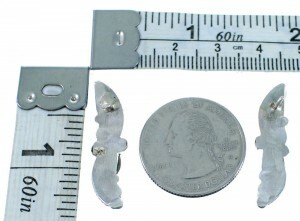 Post earrings measure approximately 1-1/8" long and 3/8" wide. If you are looking for elegance and beauty, you have found it! 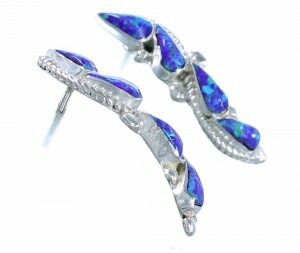 This piece of Native American jewelry is Zuni hand crafted by artist Joan Coyote, out of genuine sterling silver and man made Purple Opal stones. A total of EIGHT stones (FOUR in each earring) are gently placed in hand cut bezel settings, while twisted silver and mini silver beads accent for an extraordinary finish.